Anybody Feel Like Covering the Talk, Video Taping it, and/or Asking a Few Tough Questions on Behalf of The BRAD BLOG? U.S. House Judiciary Committee staff informs us that October 30th will be the day for hearings with John Tanner, the DoJ Civil Rights Division's Voting Section chief. 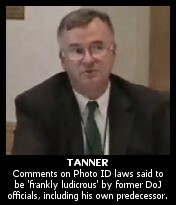 Tanner has caused a bit of a stir of late by suggesting that minorities needn't worry about being disenfranchised at the polls by restrictive Photo ID laws because they "die first" before become elderly (the original twisted BRAD BLOG video exclusive of Tanner's comments here). As well, Tanner's previous bizarre and unprecedented justifications on behalf of the DoJ, for why minorities have only themselves to blame for not being able to vote in Ohio in the 2004 Presidential Election have once again attracted the attention of John Conyers and his staff. Though the hearing where Tanner will testify is currently planned for the 30th, we're told it won't be "official" until it appears on the official schedule for the Subcommittee on the Constitution, Civil Rights, and Civil Liberties --- usually a week or so prior to the hearing. In the meantime, however, democracy and accountability fans in the Northern California area may get their Tanner fix this Thursday, as he's schedule to appear for a talk at UC Berkley's Institute of Governmental Studies. The talk is scheduled for 3:30p-5:00p at the Institute's Library, 109 Moses Hall, as sponsored by the UC Berkeley Center for Latino Policy Research and the Election Administration Research Center (EARC). More details here. Tanner's recent unbelievable comments to the National Latino Congresso --- "It's probably true that among those who don't [have Photo ID], it's primarily elderly persons. And that's a shame. Of course...our society is such that minorities don't become elderly. The way that white people do. They die first." --- made their way to both the Washington Post and the U.S. House Judiciary Committee. So who knows what he'll say next?! We hope a few BRAD BLOG readers who may be concerned with some of Tanner's statements and behavior at the DoJ might find their way to showing up at his UC Berkeley event this week to video tape and/or ask a few tough questions of the man who oversees voting rights on behalf of the federal government. If so, we hope you'll share any notable comments (hopefully on video or audio) with us! Paul Kiel at TPM Muckracker has picked up on, and advanced, our Exclusive report yesterday concerning the remarkable comments made last Friday by John Tanner, the Chief of the Civil Rights Division, Voting Unit, at the DoJ, concerning Photo ID restrictions at the polls. In a follow-up report today, Kiel gets reactions from former DoJ officials, including the man who previously held the same job as Tanner at the DoJ, charging that the remarks and logic behind them were "frankly ludicrous" and "false" and based on "cherry-picking the data that he wants to use." A DoJ source of our own wrote to us after yesterday's report and characterized the comments as Tanner's "Imus moment." Tanner had told a group in Los Angeles last Friday --- and our own Alan Breslauer was there to catch it on video tape --- that non-minorities were more likely to be disenfranchised by such restrictive polling laws laws than African-Americans. "It's probably true that among those who don't [have Photo ID], it's primarily elderly persons. And that's a shame," Tanner told the audience. He then added: "Of course...our society is such that minorities don't become elderly. The way that white people do. They die first." The implication being that, therefore, minorities are somehow less likely to be disenfranchised by draconian Photo ID laws at the polling place. 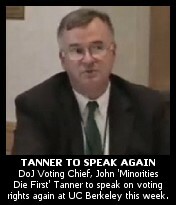 Tanner had approved a disenfranchising Georgia Photo ID scheme on behalf of the DoJ in 2005, despite the fact that 4 out of the 5 career civil rights unit staffers who had reviewed the law recommended against pre-approval under the Voting Rights Act. The law, once approved by Tanner, was later found unconstitutional by two federal courts, and described by one of the judges to be little more than a "Jim Crow-era poll tax." ePluribus Media has much more on Tanner's resume and discriminatory reign as voting section chief in the Civil Rights Division. Restrictive Photo ID laws, being strongly and strategically pushed by elements of the GOP around the nation, are controversial since anywhere from 10 to 30 million Americans, largely Democratic-leaning voters who are elderly, minorities, and/or urban dwellers, are believed to have no driver's licenses. Most states already have requirements for some form of ID when voting, though not necessarily state-issued Photo ID. Further, the federal Help America Vote of Act of 2002 already requires proof of identity when a voter registers to vote. In the meantime, by even the DoJ's own numbers, voter fraud at the polls is exceedingly rare in America. That, despite GOP kool-aid drinkers like Rep. Duncan Hunter and his recent unfounded claims to the contrary. 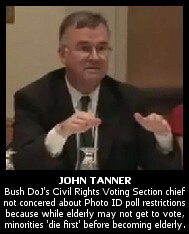 Unbelievably, the Chief of the Voting Section of the Civil Rights Division, U.S. Department of Justice, John Tanner, contends that while it's "a shame" that elderly voters may be disenfranchised by new Photo ID restrictions at the polls because many don't have driver's licenses, minorities don't have to worry quite as much. Why? Because "minorities don't become elderly the way white people do. They die first." At last Thursday's Republican Debate --- the one which the four Republican front-runners refused to attend --- sponsored by PBS and hosted by (egad!) African-American broadcaster Tavis Smiley, the question of Photo ID restrictions on voters was raised by the Atlanta Journal-Constitution's Cynthia Tucker. 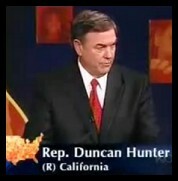 California Rep. Duncan Hunter's answer was interesting. And it's no small matter given that trying to disenfranchise Democratic-leaning voters seems to be Strategy #1 (once again, but moreso than ever) for the desperate GOP in 2008. That's just one of the reasons why Barack Obama's block of the Dem "deal" to slide through the nomination of Bush's evil GOP anti-voter zealot, Hans von Spakovsky, to the FEC today is so important. Tucker's question from last Thursday: "Many voting rights advocates are worried about rigid voter ID laws which require photo ID like a driver's license. Are you concerned that some eligible voters will be denied the right to vote simply because they don't have a driver's license?" Hunter's imaginative answer: "We have right now a real danger of people that are illegally in the country being rounded up, herded into the polls, we've seen that in California, voting illegally. That disenfranchises everybody in that community." Really? We've "seen that in California," have we? Undocumented (illegal) aliens being "rounded up [and] herded into the polls" and "voting illegally"? Whatever they have to do to win. And given the odds against them in '08, expect them to pull out every stop imaginable between now and the election in order to "win." WASHINGTON — Ohio and Florida, which provided the decisive electoral votes for President Bush's two razor-thin national election triumphs, have enacted laws that election experts say will help Republicans impede Democratic-leaning minorities from voting in 2008. Backers of the new laws say they're aimed at curbing vote fraud. But the statutes also could facilitate a controversial Republican tactic known as "vote caging," which the GOP attempted in Ohio and Florida in 2004 before public disclosures foiled the efforts, said Joseph Rich, a former Justice Department voting rights chief in the Bush administration who's now with the Lawyers Committee for Civil Rights. Caging, used in the past to target poor minorities in heavily Democratic precincts, entails sending mass mailings to certain voters and then using the undelivered letters to compile lists of voters for eligibility challenges. Asked whether they might employ vote caging in 2008, Executive Director Jason Mauk of the Ohio Republican Party and spokeswoman Erin Van Sickle of the Florida Republican Party said they couldn't discuss election strategy. See Gordon's complete report for more details. We're getting really tired of picking on Democrats. But with clueless Senators like Nebraska's Ben Nelson, it seems like we continue to have little choice. This morning's result: faced with the defection of a Democrat on the committee, later revealed to be Sen. Ben Nelson (D-NE), Chairwoman Dianne Feinstein (D-CA) chose to agree to send all four nominees, two Democrats and two Republicans, to the floor without recommendation. In other words, the committee did not vote to approve von Spakovsky, but he got through nonetheless. Next up is a vote before the full Senate, and how that vote will occur will be determined by negotiations between the Democratic and Republican leadership. Republicans are likely to seek a vote on all four nominees at once and have threatened to spike all the Democratic nominees if Democrats seek to block von Spakovsky. Feinstein only said during the hearing that a Democrat had advised her that he would support von Spakovsky's nomination. In comments to reporters after the hearing, she identified that senator as Sen. Nelson. More on the evil von Spakovsky here. More details on today's negotiations here, including Feinstein's statement: "I don’t feel that this is an unbiased individual." Minority Leader Mitch McConnnel's (R-KY) hardball in return: "None of these nominees will move across the Senate unless they move together." In related your-right-to-legally-cast-a-vote-is-under-attack news, as Arlen Parsa covered for us in a bit more detail earlier, the Supreme Court has agreed to hear a Democratic challenge to Indiana's voter disenfranchising Photo ID law. The very smart Election Law Blog's Rick Hasen sees this as good news for opponents of such laws, but we've got our money on a 5 to 4 ruling in favor of the GOP law, created (by Thor Hearne and Friends) in the hopes of keeping Democratic voters from being able to cast their votes on Election Day. We hope we're wrong, but Bush's Supreme Court hasn't given us much to be hopeful about. You'll note the supporters of the restrictive, Jim Crow-type legislation have been unable to offer a single case of a voter in the state voting as someone else at the polling place. Perhaps Sen. Ben Nelson would like to issue a resolution in support of such laws? Idiot. You remember Tim. Karl Rove's right hand (right claw?) man. The GOP's ragin' cagin' man. 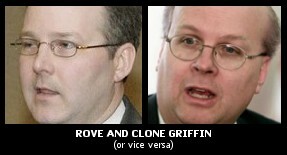 Griffin is the Rove-bot exposed by our BBC Newsnight investigations team as the man who gathered and sent out the infamous 'caging' lists to Republican state chairmen during the 2004 election. Caging lists, BBC discovered, were used secretly as a basis to challenge the right to vote of thousands of citizens - including the homeless, students and soldiers sent overseas. The day after BBC broadcast that the Chairman of the Judiciary Committee, John Conyers, sought our evidence on Griffin, Tim resigned his post as US Attorney for Arkansas. That job was a little gift from Karl Rove who made room for his man Griffin by demanding the firing of US prosecutor Bud Cummins. Last week, our cameras captured Griffin, all teary-eyed, in his humiliating kiss-off speech delivered in Little Rock at the University of Arkansas where he moaned that, "public service isn't worth it." But today, Griffin can't even get an unemployment check. When he resigned two weeks ago following our broadcast, the cover story was that the voter persecutor-turned-prosecutor had resigned to work for Presidential wannabe Fred Thompson. But when Thompson's staff was asked by a reporter why they would hire the 'cagin' man,' suddenly, the 'Law and Order' star decided associating with Griffin might take the shine off Thompson's badge, even if it is from the props department. Griffin, instead of saying that public service "isn't worth it," should have said, "Crime doesn't pay." Because, according to experts such as law professor Robert F. Kennedy Jr., 'caging,' when used to target Black voters' rights, is a go-to-prison crime. 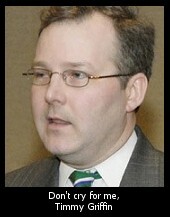 By resigning, Tim may not avoid the hard questions about caging - or the hard time that might result. When I passed the first set of documents to Conyers (a real film noir moment, in a New York hotel room near midnight), the soft-spoken Congressman said that, resignation or not, "We aren't done with Mr. Griffin yet..."
Tim Griffin, former Karl Rove protege, former interim US Attorney from Arkansas and felonious vote cager, finally answered some charges in a speech yesterday in Arkansas. Apparently, he welled up with tears at various points in his presentation --- "crying as he said he had no plans to return to politics," reported AP --- to the point that the person who forwarded us the articles on the matter, said we should "call him a wahhhhmbulance." We'd never be so cruel as to say or report any such thing, of course. That, despite the thousands of voters that Griffin sought to keep from exercising their franchise in America in 2004. During a time of war, no less. All to benefit his Republican paymasters. AP reports that Timmy says that he plans to stay in Little Rock to "open a 'bipartisan' public affairs firm." We're sure he does. "Griffin’s remarks about reports that he participated in effort to suppress Democratic votes, using a technique called "caging," came in response to a question at the end of his speech. "This is all made up of whole cloth," he said. "I didn’t cage votes." Obviously, I’ve seen the Internet stuff about caging. First of all, the allegations that are on the Internet and have spread through the tabloids are completely and absolutely false, number one. And ridiculous. Caging, as you may know, I had it looked up, is a direct-mail term for basically organizing returned mail. … And I’ll just say that it’s so untrue. … This is all made up and faux pas. I didn’t cage votes, I didn’t cage mail, I didn’t cage animals, I’m not a zookeeper. UPDATE: 6/26/07 Video of part of Griffin's speech is now available at BRAD BLOG. 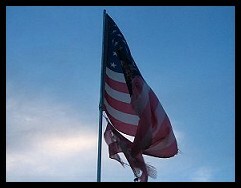 Representatives of three liberal-leaning groups came to the Justice Department in 2004, armed with evidence that hundreds of public-assistance agencies had illegally failed to offer voter registration to their mostly poor and minority clients.Congress passed the National Voter Registration Act, which imposed the requirement, in 1993. But after these agencies registered 2.6 million people to vote in 1995-1996, the total registered plunged to about 1 million in 2003-2004. Michael Slater, the Oregon-based deputy director of the national registration group Project Vote, said officials of the Justice Department's civil rights division showed little interest in enforcing that part of the law. He said the groups' representatives told the Justice Department officials: "Look, we have physical hard evidence that states aren't doing this. They're taking their eye off the ball. We want to see some enforcement." Slater said [Bush-appointee to the DoJ Civil Rights division, Hans] von Spakovsky listened quietly and then made comments to the effect of "hmmm" and "that's interesting," but took no action. Emails from Von Spakovsky recently revealed that he was also busy strong-arming and attempting "deals" with the U.S. Election Assistance Commission (EAC) on a number of issues concerning disenfranchising Photo ID poll restrictions around that same time. For his efforts in all of the above, of course, von Spakovsky would later be recess-appointed by Bush to chair the Federal Elections Commission (FEC). We yelled about that appointment back in January of 2006 when nobody was listening. The most valuable takeaway from the entire U.S. Attorney Purge scandal will likely prove to have been the exposure of the long-perpetuated GOP "voter fraud" scam. The scheme has been been so pervasive for so long, but the coverage of it has been largely contained to blogs like ours. In the interim, the MSM coverage of the issue had been given over to the well-funded Republican propaganda machine which had detailed the phony claims of "voter fraud" as if they were legitimate. The result, as designed, were calls for restrictive Voter ID legislation at the polling place, an effort that was successful in a number of states. After all, as the Republican snakeoil salesmen oft-repeated, "you need an ID to get on a plane, to cash a check, why not to vote?" It was a difficult line to refute on its face, but it was built on lies, disinformation, and attempts by this White House and this Republican party to wage an unprecedented effort to keep any portion of the 10 to 30 million Americans (mostly Dem-leaning) without photo ID's (many even without birth certificates!) from being able to cast a vote. The U.S. Attorney Purge scandal has helped to reveal the insidious scheme, opening it up for everyone to see by helping to expose the slimy, well-funded campaign for what it really is: little more than a broadly-waged, party-funded, voter suppression ploy. Scores of MSM articles and columns over the past week or two have finally helped expose this scam to the public, and the likes of vote-suppression operative Thor Hearne's well-financed, systematic, White House-run "non-partisan" American Center for Voting Rights (ACVR) has, for now, slithered back underground. Apropos of voter registration database problems elsewhere, as covered by BRAD BLOG's Michael Richardson earlier today, the Georgia Secretary of State's office has announced an investigation into how 75,000 voter registration cards ended up in an Atlanta trash bin, exposing sensitive information with voters' full names, addresses, and social security numbers. The 18,000 "undervotes" in Sarasota and other questionable elections in November 2006 election were not the only problems faced by Florida voters last year. Most of them, in fact, likely have no idea just how bad it really was. Florida's statewide voter registration database, and election management systems designed to work with it, were plagued in early 2006 with a host of problems. Some of the details are now revealed by a raft of email messages sent recently by a source to the non-partisan election integrity watchdog group BlackBoxVoting.org which posted them quietly on their site for public scrutiny. Sixty-four email messages to election officials, spanning a four-month period from January to April 2006, from VR Systems, a Florida corporation, document a staggering series of serious problems with Florida's new computerized voter registration database during the early months of its implementation. The emails, from Jane Watson, a manager at VR Systems, provide a disturbing picture vis a vis a nearly day-by-day report from inside the software test lab. The Florida Voter Registration System (FVRS) is statewide voter registration database described by Watson in the emails as a "home grown system" built by IBM to Florida specifications and maintained by Department of State staff. Voter Focus is a software system, unique to Florida, which provides election management functions to 60 Florida counties. The emails tell the tale of software failures which began in January 2006 as programmers furiously work to solve program glitches and failures prior to the state's upcoming elections. The system went online before development was complete, in order to meet the January 1st deadline imposed by the Help America Vote Act (HAVA). The source of the Florida emails, an insider familiar with the development and implementation of the database who has requested anonymity, tells The BRAD BLOG that, "The system should never have seen the light of day until the bugs were worked out. They used the voters and county election officials as guinea pigs to experiment on and test the program." Documented failures include the software somehow, without apparent reason, switching the party registration for voters. As one of the emails describes: "We are seeing instances of voters being changed to a different party when there was no user activity. This is our top priority now." And the next day: "We worked this weekend on diagnosing voters whom we suspected as having had their party changed by Voter Focus...There were 3 counties with high numbers of suspected cases of this kind of inadvertent party change." The emails remain unclear on whether the problems were completely found and fixed, and whether or not all voter files had been correctly restored. Later emails suggest that various related problems still existed months later when voters, whose registration should have been recorded in the system, were nowhere to be found. Votingindustry.com, a website which tracks the progress of the implementation of statewide registration databases, currently describes Florida's system as "Still working out kinks." Jane Watson, the author of the memos, spoke with The BRAD BLOG and confirmed the authenticity of the emails. She explained that the federal government with its HAVA mandates "didn't understand the time it takes to develop programs." While Watson stressed her confidence that no voter was disenfranchised in 2006 because of bugs in the statewide voter registration system, she admits that "party changes never have worked as well as they should" and that "there are still some things to work out..."